Glenn Irwin claimed a brilliant win in the Superbike opener on the PBM Be Wiser Ducati. Pole man Glenn Irwin produced a dominant performance to take his second Vauxhall International North West 200 win in the opening Superbike race on Saturday. Irwin powered into the lead on the PBM Be Wiser Ducati and led on each of the seven laps as he claimed a popular victory by one second over Bradford’s Dean Harrison (Silicone Engineering Kawasaki), with 14-time winner Michael Rutter in third on the Bathams BMW. Irwin charged into a lead of 3.7 seconds after only one lap and increased his advantage to five seconds by the end of lap two, with Alastair Seeley, Rutter, Harrison, Michael Dunlop and Lee Johnston giving chase. A mistake at the Juniper chicane saw Irwin’s advantage slashed to less than one second by Harrison at the end of lap four, but the Carrick man put the hammer down once more and extended the gap to almost two seconds. He could afford to roll off on the last lap and closed out a brilliant victory on the Italian machine. 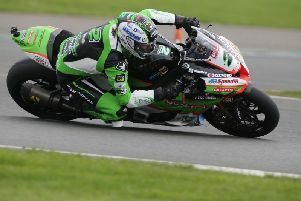 Seeley was hit with a five-second penalty for jumping the start on the Tyco BMW and finished the race in fifth behind Honda Racing’s Johnston, with Conor Cummins sixth on the Padgett’s Honda. The Manx rider received a ten-second penalty after overshooting at Mather’s chicane. Michael Dunlop pulled into the pits at the end of lap four, while team-mate Dan Kneen also failed to finish the race.